Hanover junior quarterback Will Bruna has completed 204 of 267 passes for 3,268 yards with 56 scores against four interceptions. He has set state eight-man records in passing yards and touchdowns for a single season. As well, the Wildcats have returned seven interceptions for scores, also a new eight-man mark. Even with the records, Hanover doesn’t have the most efficient offense or the best scoring defense in Saturday’s Eight-Man, Division I state championship game. In a highly anticipated matchup of contrasting styles and 12-0 teams, No. 1 Spearville plays No. 2 Hanover. Game time is 11 a.m. at Newton’s Fischer Field. Spearville, behind its unique single-wing offense, averages 10 yards per play. The Lancers have not turned the ball over all season. Hanover, with no offensive starters and two defensive starters back, is at 9.4 yards per play. The Lancers have 80 percent of its offense on the ground, while the Wildcats collect 75 percent of its yards from the air. Spearville has a collective scoring margin of 658-124, while Hanover stands at 684-194. Prep Power Index lists the Lancers as a six-point favorite. Spearville has made its first state championship game, while Hanover is the defending runner-up after it lost, 42-30, to Central Plains last year. Spearville went 10-1 last season and has built an elite program under Fowler. Hanover has won two state crowns with Heuer. Spearville has faced multiple standout quarterbacks this season, including Dighton-Healy’s Tyler Lingg, Hodgeman County’s Jacob Salmans, Central Plains’ Braedan Crites and Solomon’s Jake Tiernan. Crites and Tiernan have come in the last two weeks. The Lancers contained the first three, though Tiernan passed for 379 yards last Friday. Bruna, who has seven brothers and two sisters, took over an offense that returned no offensive and two defensive starters. Senior Trey Lohse has 68 catches for 1,182 yards and 24 scores. Senior Matthew White, also with three interceptions returned for scores, has 32 catches for 663 yards and nine touchdowns. Senior Devin Juenemann has 49 catches for 636 yards and 11 scores. Bruna is the leading rusher with 613 yards. “But at the same time, I don’t want to take anything away from Will, but our receivers have done a great job of recognizing the coverage, understanding what they are trying to do defensively and finding the open area, and Will does an extremely good job of finding them and being on the same page with our receivers,” Heuer said. Spearville senior quarterback Nathan Stein, a three-year starter under center, has passed for 682 yards and 16 scores versus no interceptions. He has rushed for 750 yards and 16 scores, leads the team in tackles and serves as the team’s kicker. 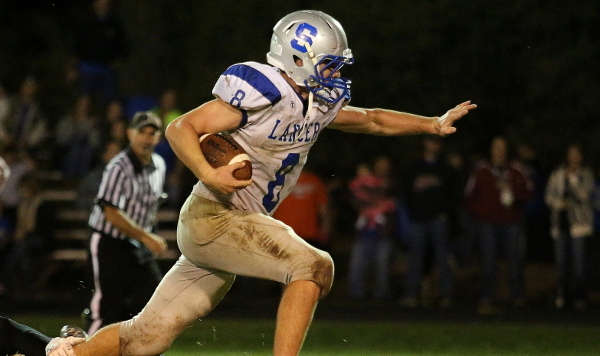 Speedy junior Luke Heskamp has 102 carries for 1,361 yards and 28 touchdowns. Fowler gave ample credit to starting wingbacks Brandon Davis and Bailey Sites, a senior and sophomore, respectively. The pair brings in the plays and alternates every snap. In an offense that relies on ball faking, Davis and Sites are often tackled multiple times a game without the ball. Spearville has seven defensive/special teams scores. Spearville, known for its fast starts this season, led 16-12 after the first quarter and 40-20 at halftime en route to a 68-36 victory against Solomon last week. Two weeks ago, it defeated Central Plains, 58-28, and led 24-6 after the first quarter. “Our offensive line is playing on a very high level, and there are sometimes where there aren’t tackles to break or tacklers to make miss,” Fowler said.